Taggle are Australia’s dedicated M2M network provider, revolutionising low cost monitoring for Australian water resources through the use of cutting-edge radio technology. The system Taggle offer is a fairly complex one if you aren't technically minded - however the cost savings that can be achieved by governments and businesses is huge. 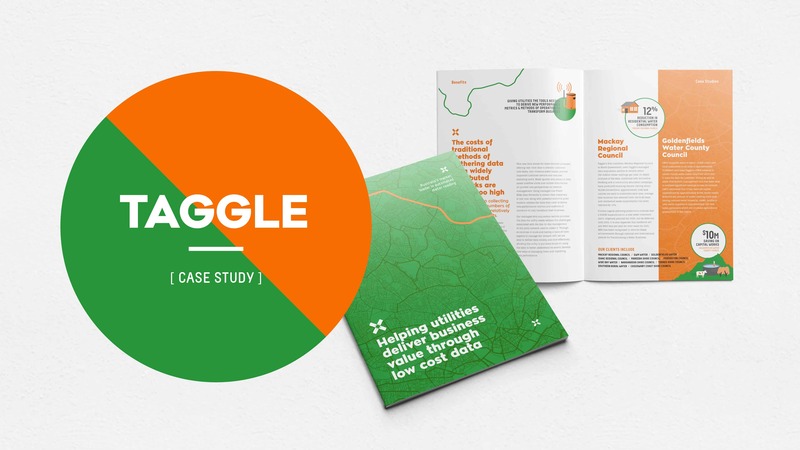 Our challenge for this project was to decipher and re-tell the complex Taggle story in a simple, easy to understand language that would grab the interest of potential new clients and generate leads, especially from local councils wanting to save money on utilities. With a looming trade show on the horizon, we set about developing a strategy for maximising both impact and engagement. One of the key aspects of Taggle’s complexity comes from its process. Initial ideas were based on creating something visual that would help to break the system down and show the 'low-cost, low-power, long-range communications' in a more user-friendly format. We developed ‘Taggle Town’ - an infographic map that embodies the entire service Taggle can provide communities across Australia. Using an approachable and friendly illustration style to replace a typical technical diagram, helped to break down some of the 'tech' barriers and language that had surrounded the Taggle brand. Taggle Town then became the centre piece for the tradeshow as both a back wall graphic and centre spread in a new, condensed, and easy to understand brochure. Combining elements of simplicity from Taggle Town, a more humanised language developed through copywriting, the final sales piece speaks with clarity and confidence, presenting Taggle as a professional, trustworthy and forward thinking company. The trade show was also a huge success in attracting new interest from around Australia and capturing valuable leads. "We'd like to thank Emedia Creative for their recent help in creating our new corporate brochure which has been well received by both customers and colleagues alike. More importantly, I very much appreciated the efficient turnaround on our project. We presented a very tight deadline and Emedia Creative managed to complete the project on time and with a minimum of fuss. Their communications were clear, concise, and the offered a sequence of deadlines, by which we each had to complete activities, made the entire process so easy. I look forward to working with the Emedia Creative team again."